Mobile Tune Up was proud to support it’s first Marine Corps Reserve Toys for Tots Program for 2012. For every “NEW” unwrapped toy given, we gave away 1 raffle ticket. We chose a winner from the raffle and that winner received a $100 gift card to Best Buy! Who was the lucky winner? The winning raffle ticket for the toy donations was 293879. Congratulations to Bob and Kathy C.
Thanks to all of our customers for donating toys for the Marine Toys for Tots Foundation. Thank you for making a difference this holiday season. 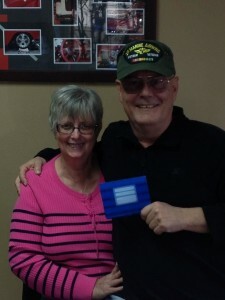 The 2012 Marine Corps Reserves Toys For Tots Raffle Winners, Bob and Kathy C.